Speaking of, if any of you are interested in seeing more about the history of the Japan uniform, and also details about the design concept of this new one, take a look at Adidas' snazzy site. >>click to go to Adidas Japan National Team site You will need to unblock any pop-up blockers, and click the ENTER button in the middle of the page that appears. Under the PRODUCT category, you will see options to see the new home jersey and the home jersey history. You can click around and see all the photos of the jerseys there. 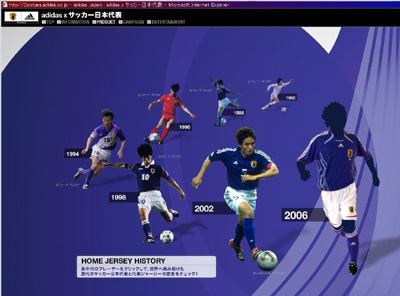 Under DOWNLOAD, they have wallpapers of Nakamura, K.Nakata, and Miyamoto, if you feel like getting into the Japan NT mood.